Currently, lane change decision aid systems primarily address foveal vision and thus compete for drivers’ attention with interfaces of other assistant systems. Also, alternative modalities such as acoustic perception (Mahapatra et al., in: 2008 International conference on advanced computer theory and engineering, pp 992–995. https://doi.org/10.1109/ICACTE.2008.165, 2008), tactile perception (Löcken et al., in: Adjunct proceedings of the 7th international conference on automotive user interfaces and interactive vehicular applications, AutomotiveUI ’15, pp 32–37. ACM, New York, NY, USA. 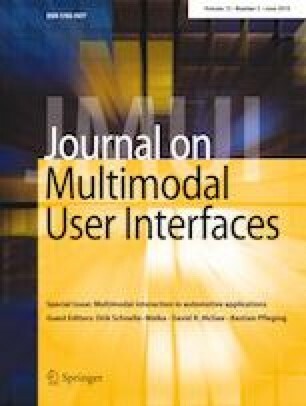 https://doi.org/10.1145/2809730.2809758, 2015), or peripheral vision (Löcken et al., in: Proceedings of the 7th international conference on automotive user interfaces and interactive vehicular applications, AutomotiveUI ’15, pp 204–211. ACM, New York, NY, USA. https://doi.org/10.1145/2799250.2799259, 2015), have been introduced for lane change support. We are especially interested in ambient light displays (ALD) addressing peripheral vision since they can adapt to the driver’s attention using changing saliency levels (Matthews et al., in: Proceedings of the 17th Annual ACM symposium on user interface software and technology, UIST ’04, pp 247–256, ACM. https://doi.org/10.1145/1029632.1029676, 2004). The primary objective of this research is to compare the effect of ambient light and focal icons on driving performance and gaze behavior. We conducted two driving simulator experiments. The first experiment evaluated an ambient light cue in a free driving scenario. The second one focused on the difference in gaze behavior between ALD and focal icons, called “abstract faces with emotional expressions” (FEE). The results show that drivers decide more often for safe gaps in rightward maneuvers with ambient light cues. Similarly, drivers decide to overtake more often when the gaps are big enough with both displays in the second experiment. Regarding gaze behavior, drivers looked longer towards the forward area, and less often and shorter into the side mirrors when using ALD. This effect supports the assumption that drivers perceive the ALD with peripheral vision. In contrast, FEE did not significantly affect the gaze behavior when compared to driving without assistance. These results help us to understand the effect of different modalities on performance and gaze behavior, and to explore appropriate modalities for lane change support. When conducting the experiments, F. Yan and A. Löcken were still affiliated with the University of Oldenburg. This work was partly supported by the funding initiative Niedersächsisches Vorab of the Volkswagen Foundation and the Ministry of Science and Culture of Lower Saxony as part of the Interdisciplinary Research Center on Critical Systems Engineering for Socio-Technical Systems. We thank Patrick Drews and Maleah Maxie for their work on the light cues and collecting the data. Also, we thank Lars Weber for his support with the driving simulator.